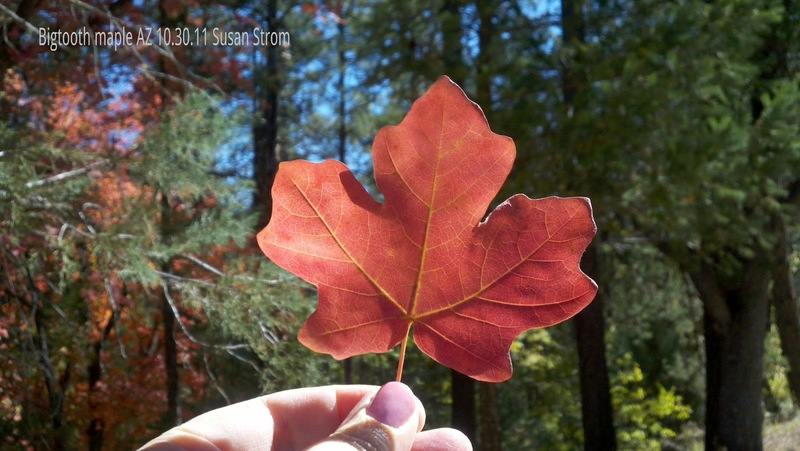 Autumn is a ways away, but one of its gifts is actually all around us at present. 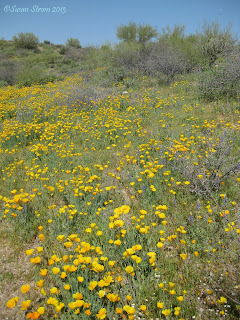 It is springtime now, and though not fall leaves, there is remarkable color to be had in the Sonoran Desert. 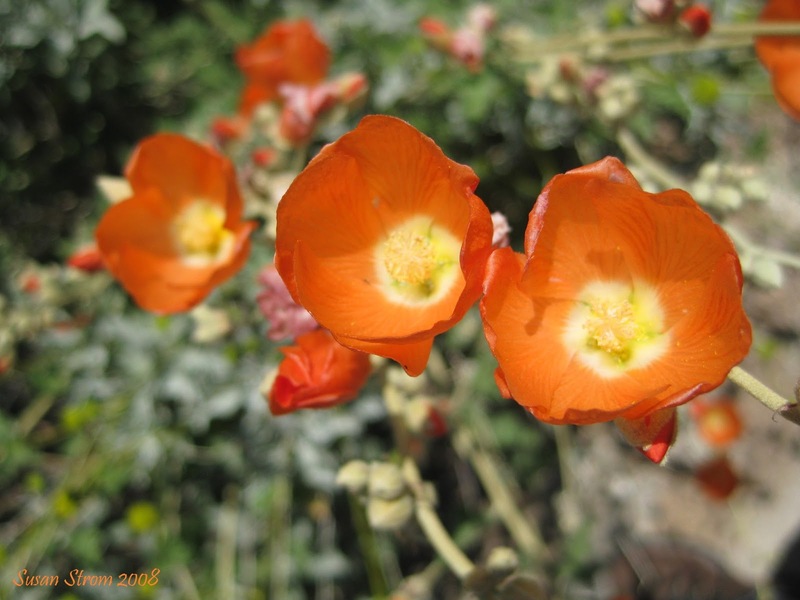 Many desert spring wildflowers actually germinate in the fall. 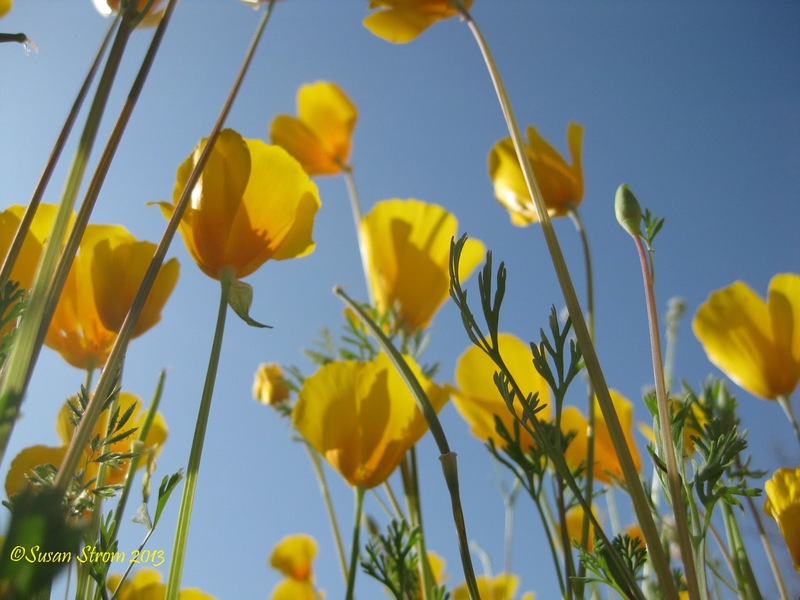 Autumn rains and autumn temperature patterns lay the blueprint for spring’s bloom. 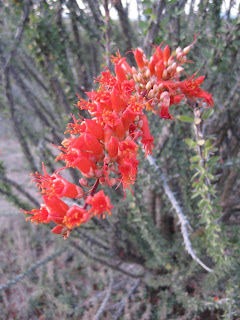 So why not hunt for desert spring's color now, another gift of autumn. 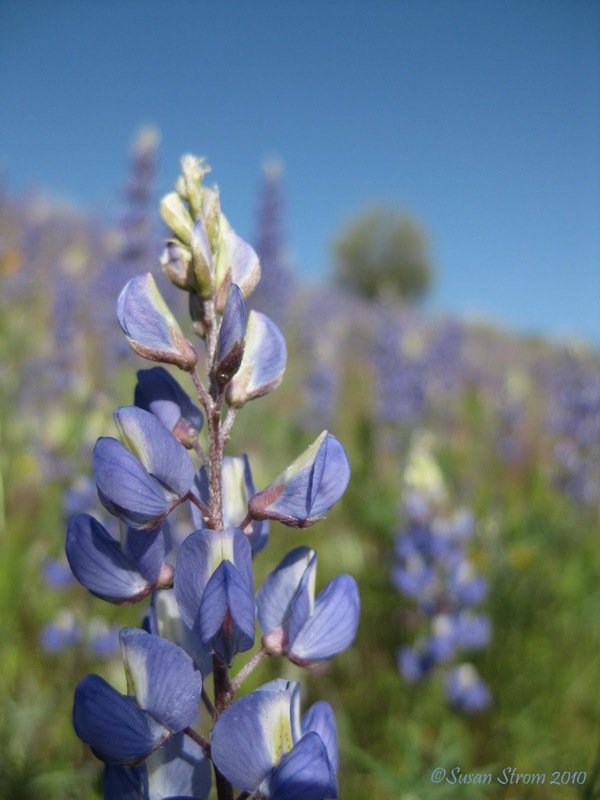 Fun as that treasure hunt sounds, flower-hunters need not rely on the rare. 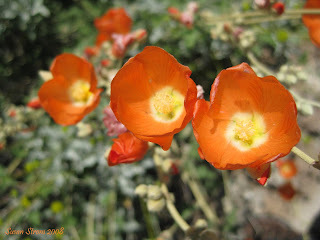 More common golden poppy, blue lupine, purple owl clover and orange sherbet-colored globe mallow delight passersby. I sat down on the desert floor, so that all the heads of the blue lupine lined up at eye level. Together they became a wave of cornflower blue. 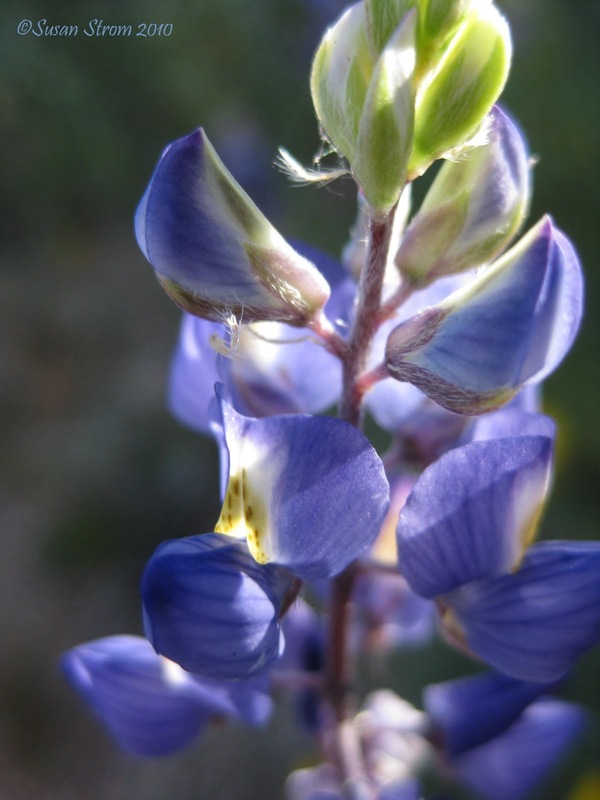 Each blue blossom on the stalk of the lupine, to me, resembles praying hands. 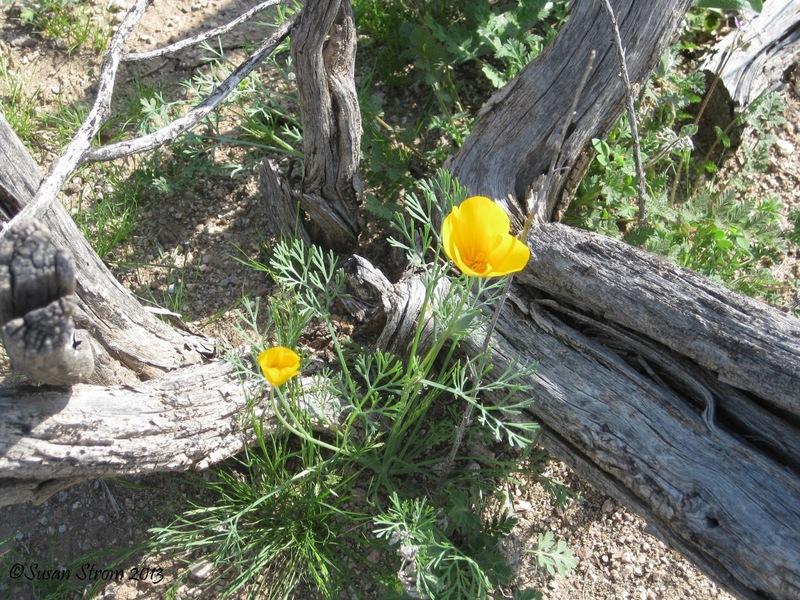 Desert flowers around Phoenix can be enjoyed roughly February through April, with additional cactus blooms (such as Giant Saguaro) in May. Be aware of snakes and bees, watching and listening as one walks, and protecting against strong sun. 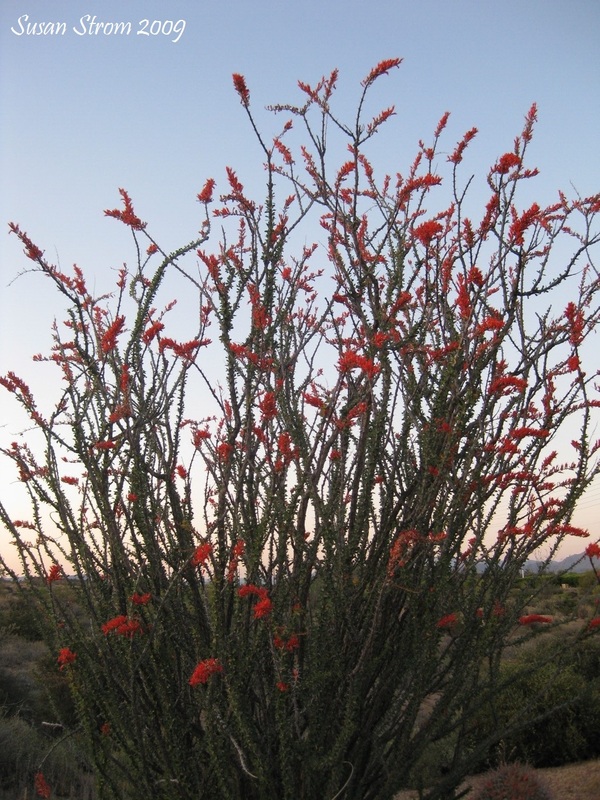 The red flags of ocotillo may appear more than one time during the warm season. Those who would dismiss a desert, particularly the Sonoran, as “barren” or a “wasteland”, just from a few glances out a car window, have not yet explored its true characteristics. 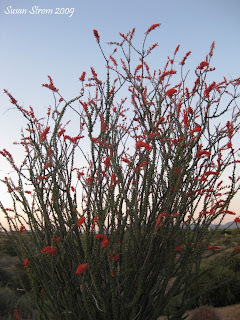 Having served as a desert guide (mainly for stormchasing) for European film crews, I recommend looking at the desert two ways…from high above, where one can get a sense of its labyrinthian vastness and sky, then intimately, close up with the plant, rock and flower. The eagle view, from plane or mountain summit, of which there are many accessible, married with ground level observance will reveal relationships between earth and sky, monsoon and mountain, season and subtlety. 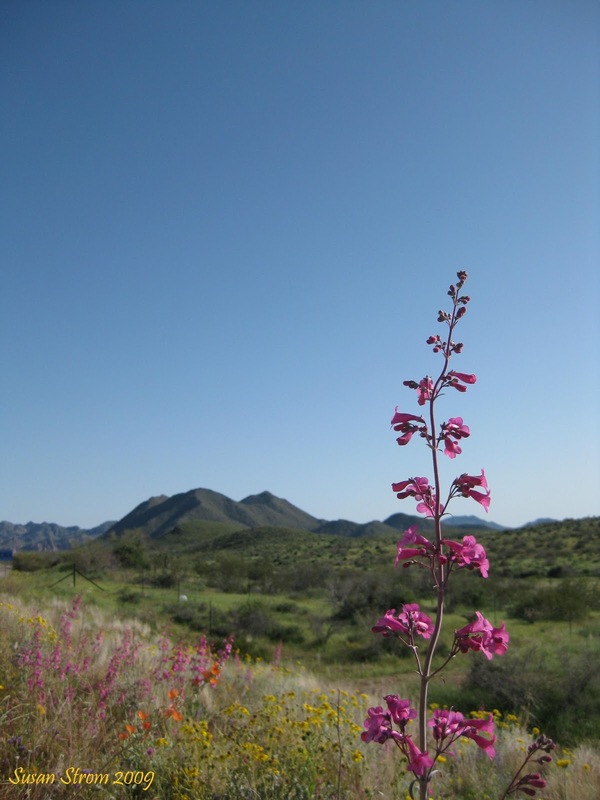 Sonoran Desert explorers will learn of two rainy seasons, winter and Monsoon, how lightning will cause a fire, burning away dead brush, allowing for nutrients to help spring wildflowers thrive. The desert will reveal itself as an interconnected, magical world, where perfection is prerequisite to survival. 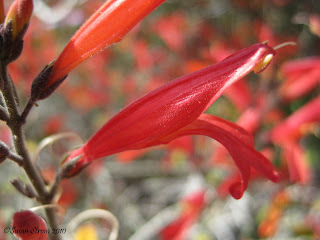 Exquisitely small leaves, cleverly miniscule and oil-shined to prevent evaporation, are dotted with attractive blooms. 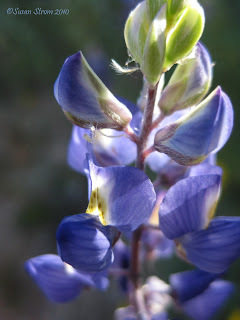 A tripod and camera’s macro setting can capture them. Or, spring is the perfect time to set up an easel and make an oil painting on site. 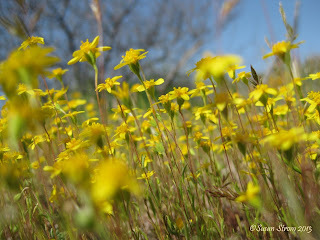 Bursts of color will change with the phases of spring. Roughly, spring begins with delicate wildflowers and the greening of hills. 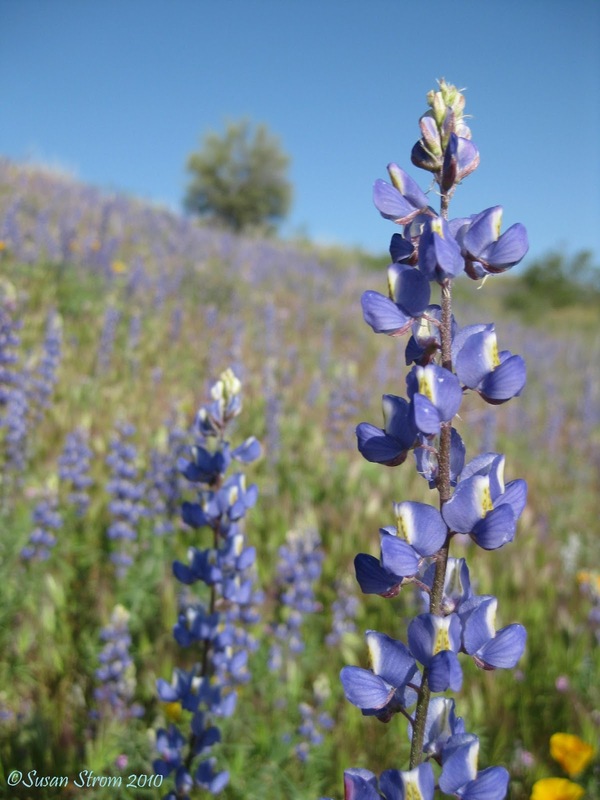 See blue lupine, poppies, and soft ankle-high purple fluffs of owl clover. 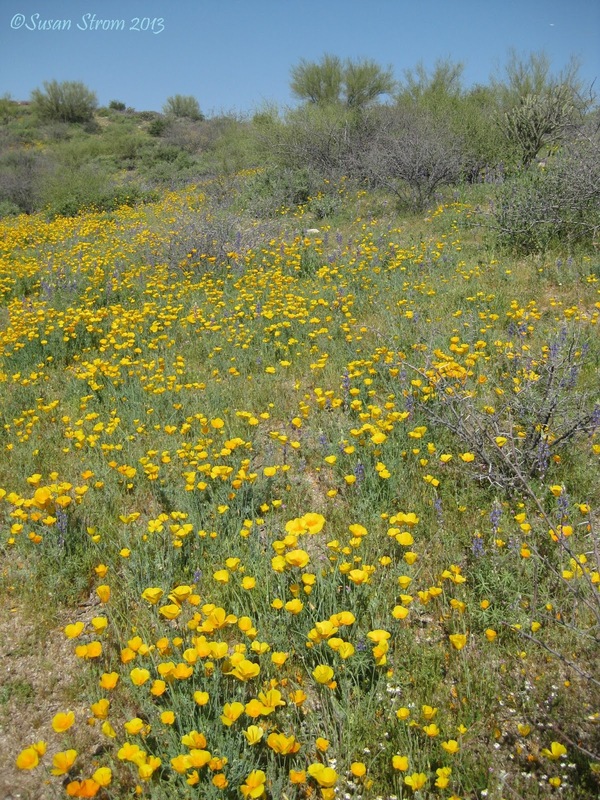 There may be desert marigold, blue dicks, pink penstemon and white desert chicory. 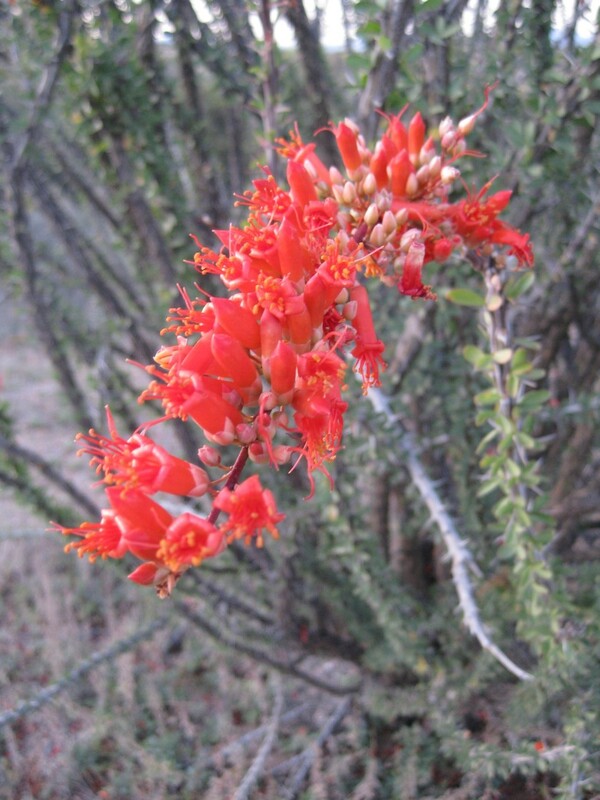 Bushes then bloom, chupa rosa's small red trumpets, creosotes, brittlebush’s sunny yellow and ocotillo, resembling long wands with bright red candles on the ends. Cactus flowers, some as big as a human hand, burst forth as spring’s Acts I and II of wildflowers and bushes come to a close, and the cactus flowers of Act III open up. Sonoran spring is a picture, a kaleidoscope view into which one can get up close and personal in a colorful, sensual world. 2009. The Moon hung suspended like a miner’s lamp over the high prairies that lie between wide swaths of forest in the White Mountains of Arizona. The pure, dark sky presented itself not flatly, but with dimension, like the blackness of a long, deep well. 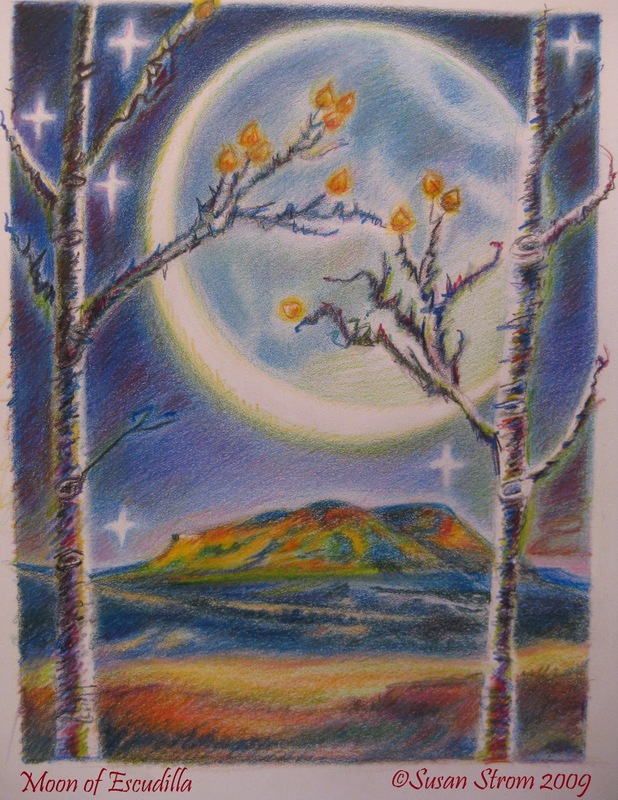 “Well, Moon, it is you and I.” Under the floating Moon, I contemplated if I should continue on to Eagar and Springerville, unsure what lie ahead or if there was lodging at all along this lonely road through this wide open moor. I could continue to trek into the night but I thought for sure I might be missing beautiful country for lack of light. If what lie before me imitate what I had seen today, the road ahead is one not to miss. I had just photographed a sunset scene at a lake called A-1, at 8,900 ft elevation. I decided to turn about and lodge in Lakeside for the night. 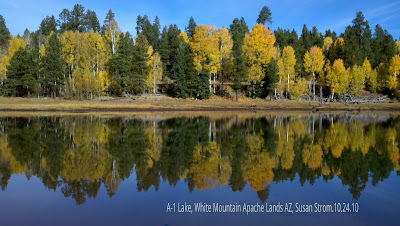 I would double back and cross again through the White Mountain Apache land’s aspen forests and pass by A-1 Lake by moonlight. I must be on elk watch vigilantly. The animals of colossal size enjoy the warmth of the road’s pavement and hitting one would end my trip, and perhaps my life. An Apache hunter had taught me how they move in the woods and I knew they rove out of the trees at twilight. In autumn, as it is now, the bugling of the males seeking mates confirms their presence. A cozy bed awaited me at Motel Nine Pines in Lakeside. The owners are very nice and I enjoyed the mountain-themed rooms, with quilts, log porches, and lamps in antler style. In this type of bed I sleep soundly. I unpacked my little bags and cameras and settled in. I looked forward to taking coffee on the porch in the morning, and seeing my breath in the chilly air. Breath is rarely seen in the desert around Scottsdale where I live, about 3 ½ hours drive from here. 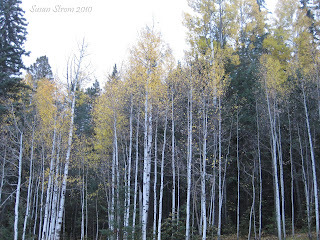 I returned the following fall to photograph additional changing moods of the White Mountains. 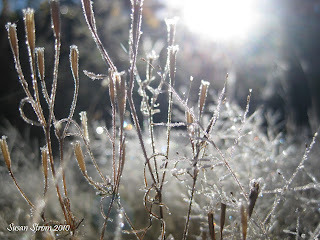 A laze with coffee was postponed as I awoke before dawn and ambled out to notice even as yet in early October, I would have to de-ice my car. The prospect of first light over A-1 Lake on the Apache lands was too enticing. I made quick work of the morning at Motel Nine Pines and got on the road to the tribal permit office at Hon Dah when it opened. Quickly achieving a permit, I was on my way out Highway 260 east and past McNary. Slanted spears of sunlight angled through the ponderosas as a blue-gray haze crept along the forest floor. 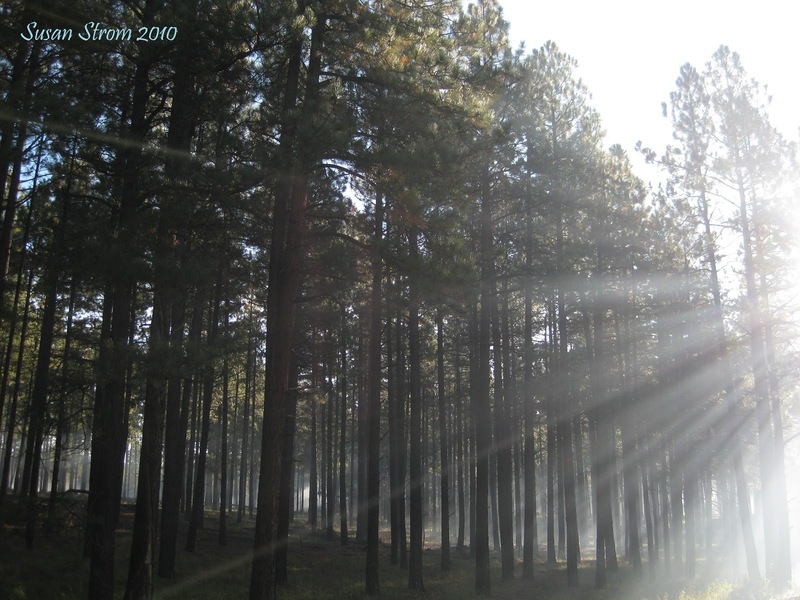 I had heard of a controlled burn to be scheduled and welcomed the serendipity of the forest’s ghostly appearance in the camera. A-1 Lake emerged from the trees and I took the small drive to the waterline. 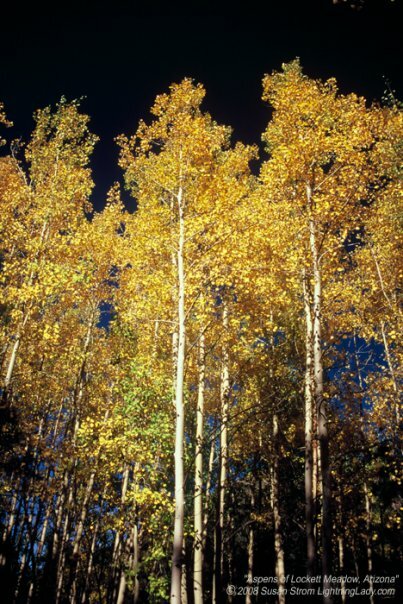 Aspen leaves scattered the drive like chocolate coins in their gold foil wrappers, leaving the bottoms of the aspens’ white trunks bare like spears and the tops still adorned with leaves. The half-dressed trees portended that autumn arrives but slips away yet again so quickly. The transitory nature of autumn’s beauty in the White Mountains always reminds me to avail myself of every opportunity for a photograph in the moment. As in life, re-dos are not possible for magic moments, so embracing their high points at present wraps them up like gifts to us before the moments are gone. Hopefully, climaxes of life at least end up in camera or journal. 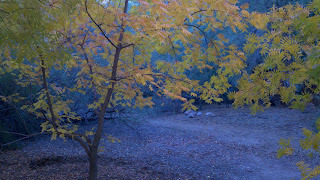 Aspens will change, as the moments tick off too quickly, but we can be a part of it at the very least. At the lakeside, the water surface and morning sky were still intertwined as the water became a perfect mirror for the day’s new sky. 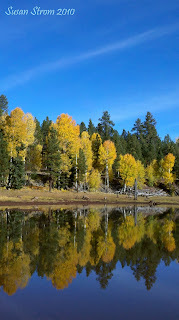 Aspen in their golden robes lined the shore and reflected perfectly in the mirror. Winds were absent. 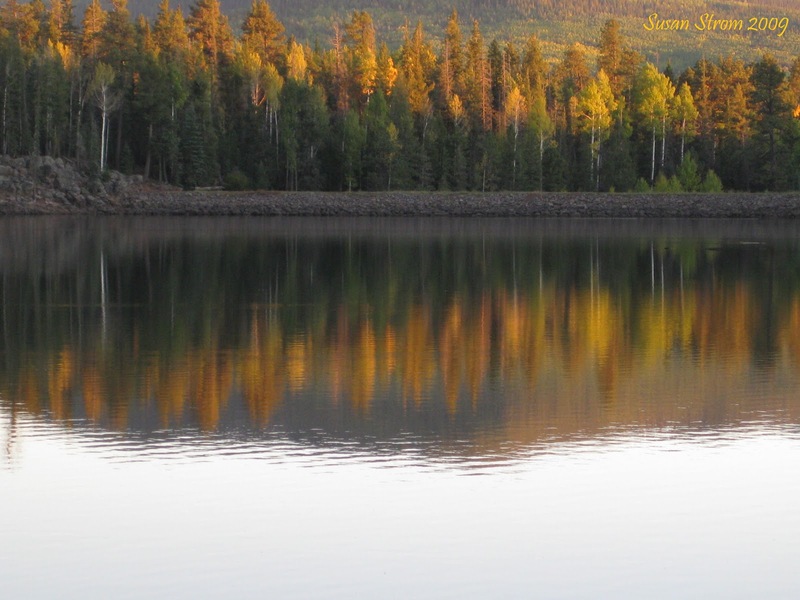 The water lay still as a stone, taking on the turquoise hue of sky and the aspens the color of a lemon on fire. I flew out of the car and set up my equipment lest the wind breathe on all this and wipe the scene away. Frame after frame jumped into the camera. I was grateful for arriving on time. What puzzled me most was that the spectacle, although accessible by highway, was seen by only me. I shared this magic moment with only the birds and the wind as I pondered the absence of naturalists and other photographers. Perhaps A-1 was just too far from cities or predawn darkness was just too early to set out. Perhaps Arizona is so big that our 116,000 square miles scatters those who explore it over the expanse of a great land, one with many miles between porch lights. Expectedly, the mountain winds began to stir within minutes, perturbing the mirror and turning it into a quivering satin sheet of gold and blue. 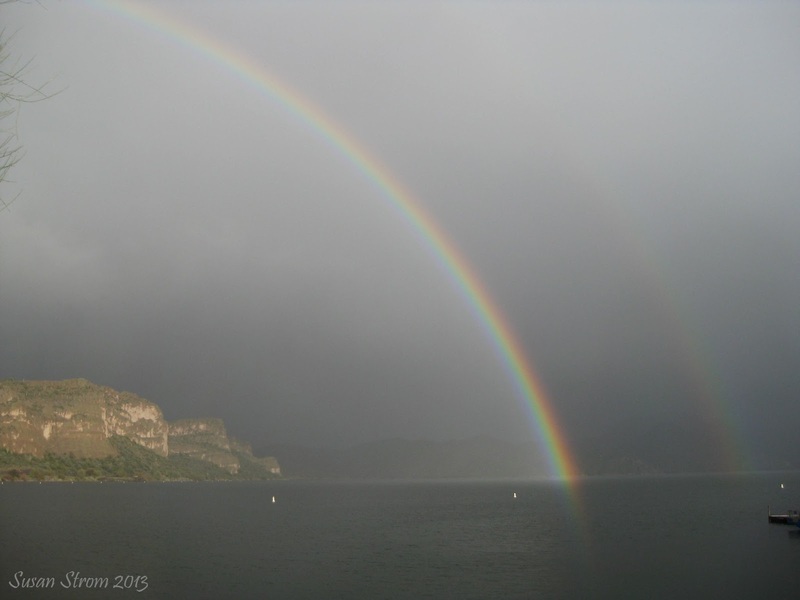 I knew the still scene was unlikely to emerge again for the day as the winds arrived. I started to take down my gear. A couple en route to somewhere else pulled in and spoke to me briefly. They were pleased to see the beautiful lake but missed the morning’s glassy moment, now thankfully frozen in time in my camera. The sun was gaining brightness and chasing morning’s gentle light away. I too turned to leave. The lake was now alone again under a paler sky, as photographer’s light would leave the stage until sunset. 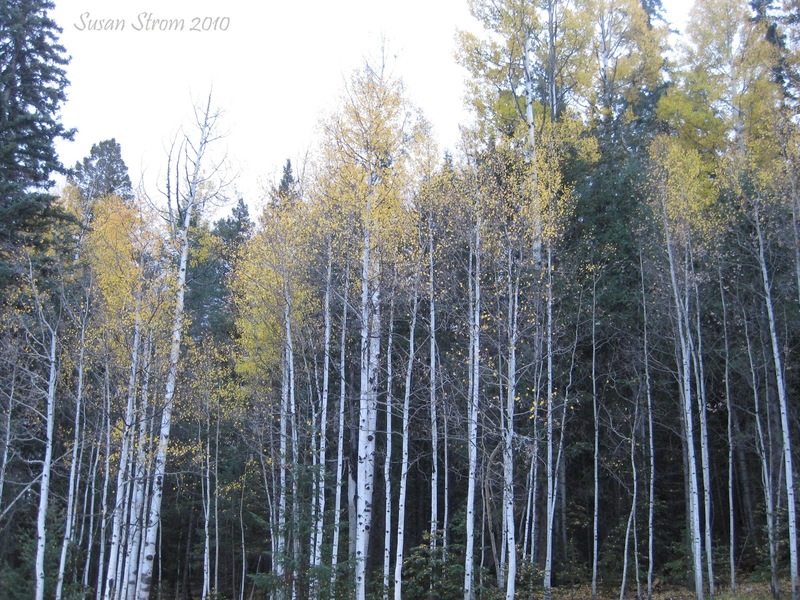 Back out on the highway, a small side road led me through to a thick and healthy aspen grove. I enjoyed how the fresh, flawless golden leaves sprinkled the conifers with yet more gold coins, as if decorating the young pines for Christmas. Leaves coated the ground in a yellow polka-dot quilt. Others got caught in the arms of pine needles. Still wet, the flat gold surfaces sparkled with morning dew. I would crouch down and photograph the droplets on macro settings, as they splayed out on the little surfaces like diamond chips pavé-set on a bracelet. 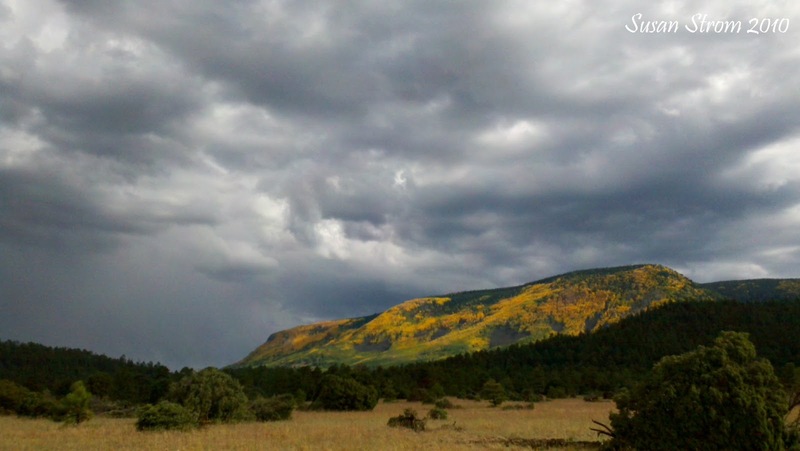 A patchwork of thick forest glades and wide open prairies compose the White Mountains. Roaming it, one is cocooned in thick conifers and aspen, only to burst forth minutes later onto an expansive cienega, or high altitude meadow or plain. Beyond the plain, yet another island of woods presents itself on the horizon. 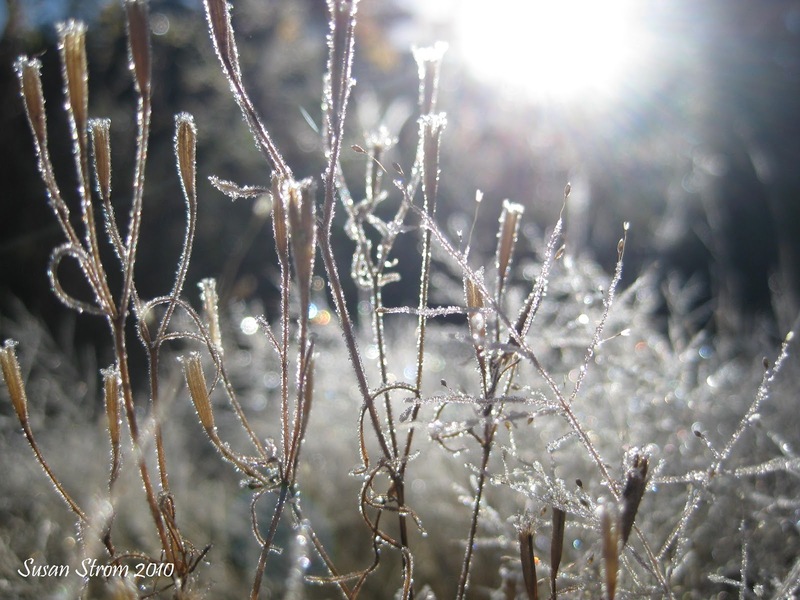 A frozen cienega in autumn offers much to the early-rising photographer as well, as frost clings to meadow plants, sparkling and scattering the spectrum in the sun. 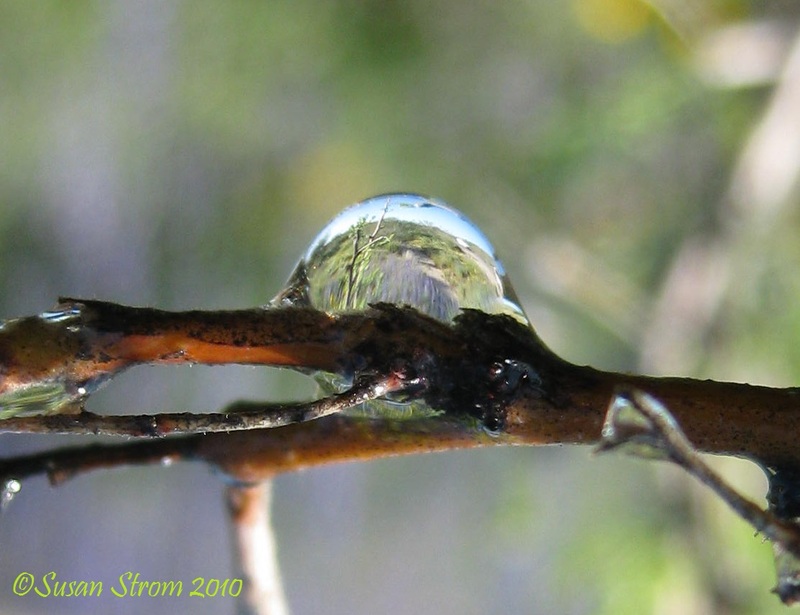 A macro setting and tripod can capture the small, magical icy worlds. Beyond the large prairie at Sunrise ski area turnoff, Highway 260 continues east to Eagar and Springerville, Arizona. 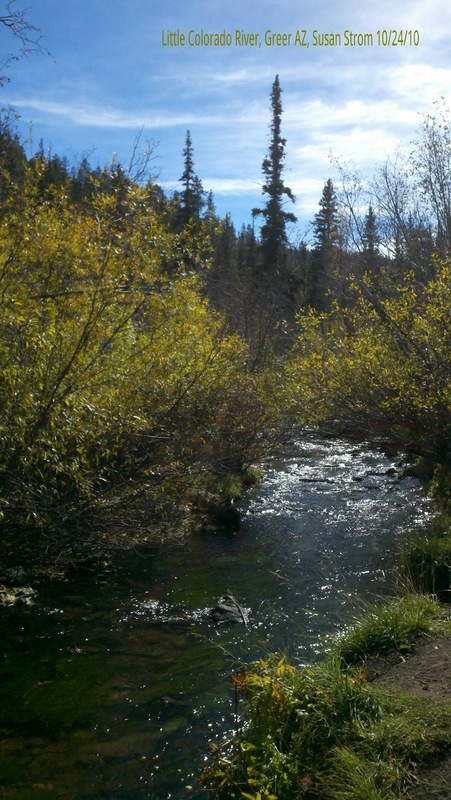 First, a glade thick with pine and aspen color presents itself. Pole Knoll is used in winter for cross country skiing, but empty each time I have stopped there in the fall. Fresh, healthy aspen color again is found among the dark green pines. Tall, wheat-like grasses mark the season and wave in the autumn wind. 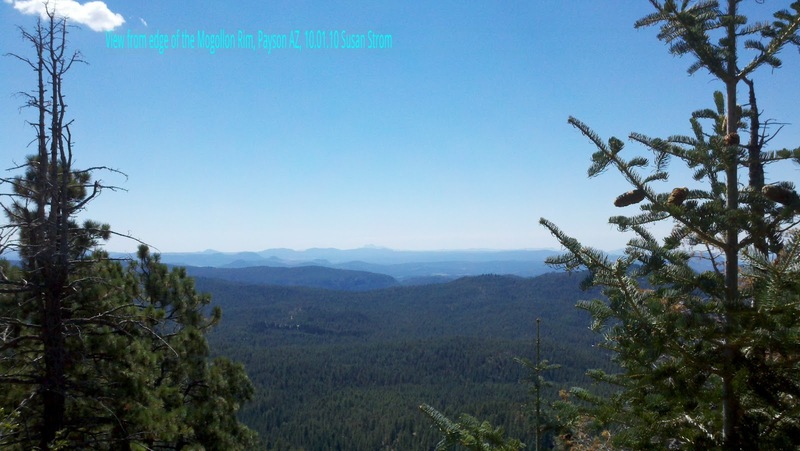 Eagar and Springerville lie close to the New Mexico state line, on the eastern side of Arizona. 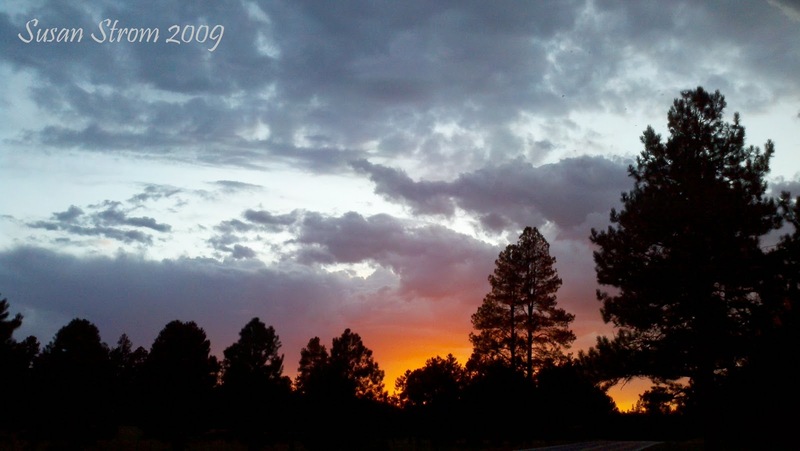 Each town has some services but the first time I visited in 2009, I did not stop long to explore as I wished to continue south on Highway 191 to additional forests. Over the first rise south of Eagar and Springerville, one is temporarily deceived by an increasingly arid-looking landscape of mesas, scrub trees and plains. Around a bend in the road heading south, a sudden and surprising land form emerged out of nowhere. Sadly, at this juncture I have to write this portion in past tense, as the majesty of the scene was involved in the human-caused Wallow Fire in 2011. Escudilla Mountain of nearly 11,000 feet, was festooned with golden aspen color head to toe. I consider myself lucky to have seen the mountain in its splendor, prior to it becoming a casualty of the largest wildfire in Arizona State history. Some say Escudilla still lives. Though many aspen groves are said to be charred, the fire jumped to and fro in a patchwork fashion, sparing some of the forest. As yet, I have not been out to look at Escudilla. I would like to remember pre-fire state of it, the mountainside’s astonishing quilt of gold. I do not know to what extent the fall color is suspended on the mountain. Perhaps someone will show photographs to the contrary at some point. For now, I remember how it literally stopped traffic on Highway 191, as people pulled over to snap a photo of the yellow rising summit in the fall. I did as well, and ventured on the dirt roads to get closer to the peak to take pictures and create memories to sketch from later. I once left a copy of my drawing with the Motel Nine Pines. Owner, Kenny, enjoyed long hunting trips in the Escudilla and pinned it over the front desk. Spanish for “bowl”, Escudilla hopefully will enjoy resplendence in future generations. Meanwhile, we can only hope that recent wildland conflagrations will be seared into our memories so as to make us conscientious at the campfire. Forever, Escudilla, remote mountain, you’ll come back some day. 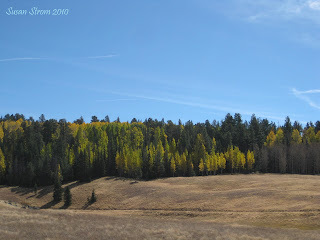 Further south on 191, thick groves of ponderosa, aspen and silvertip carpeted the miles. 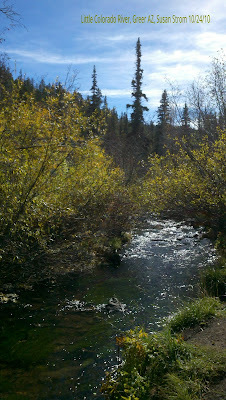 On that first trip, I drove through, taking readings measuring in the 9,000 ft range with my altimeter. I stopped at the hunting lodge at Hannagan Meadow, also asking the name of the mystery mountain I saw near the small town of Nutrioso. At the time, I did not know the name Escudilla. The lodge was quiet. Again, I was the only one in the lodge café. The server wearing a cowboy hat informed me of the mountain’s name. 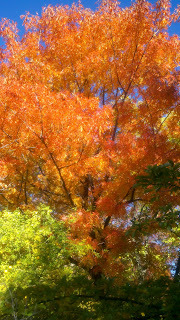 I stayed awhile, wondering again how I could be the only one there on such a pleasant October day before the snows. Fortunately, to my knowledge, the Hannagan Meadow lodge escaped the fire. I took several subsequent trips back out to the White Mountains, each revealing new facets of a wildland’s ever-changing personality. 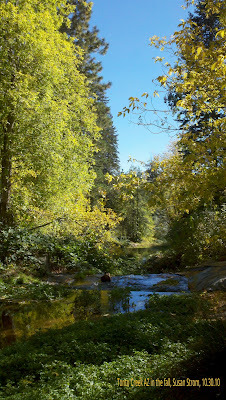 A lakeside photo, creekside walk, the chorus of bugling elk in the woods. Stormy skies, a windswept moor, alpenglow on ponderosa. 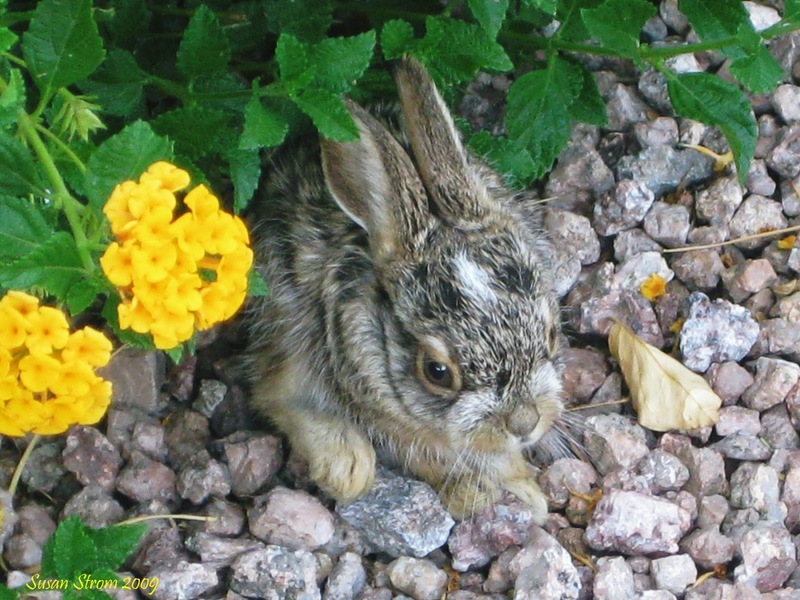 Nowhere near here is any cliché image of burros and cactus-studded deserts often seen on Arizona postcards. Every season in the White Mountains is different, from a raging Monsoon storm to fall’s gentle paintbrush, to the blizzard conditions of winter. As well, the commonplace architecture of runaway commercialism, big box retail and master-planned Beigelands has not crept in like a mistletoe, as it has in so many cities in the American West. Towns-in-a-kit, weird fake Tuscan-style villages out of place on desert mountainsides, these are a half day's drive at the nearest. 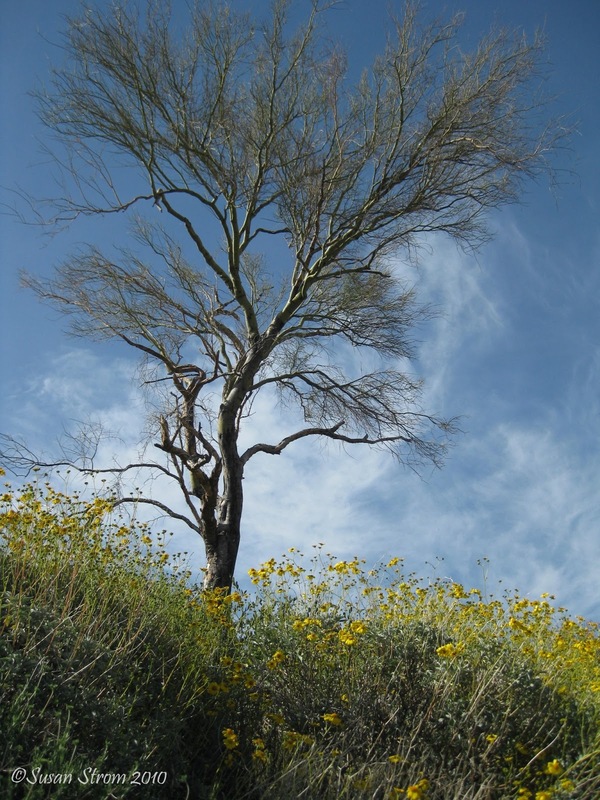 In Apache hands, White Mountain wildness remains, in trees, animals and easily detectable seasons, forever and far away, deserving of preservation, admiration, and respect. 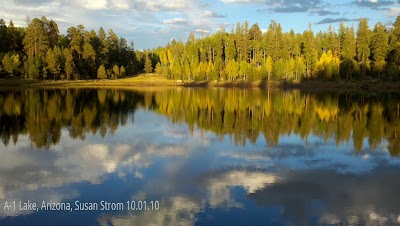 July 2012, by Susan Strom, Arizona USA. Early in the season, seek fall color at high elevations, 8,000 ft elevation and up. 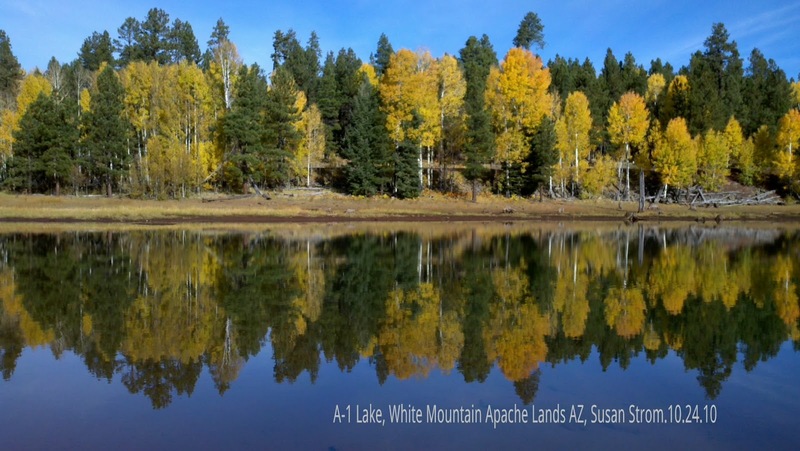 Try driving out east of Pinetop/Lakeside, Arizona to the White Mountain Apache Lands. Check with Hon Dah Casino for your tribal land recreation permit. 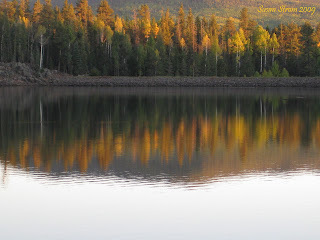 Visit A-1 Lake, off main Highway 260, to see the aspens changing. Listen for elk bugling too! Highway 260 winds you through aspen forests, and more aspens are visible on the paved road to Hawley Lake (not too many at lake level though). Check US Forest Service websites for color reports. If you find a good report, try other roads too, like the paved road that winds up to Snow Bowl ski area in the San Francisco Peaks in Flagstaff. It can be beautiful, with easy access. An alternative is to check with the ranger station on Highway 89 in Flagstaff too, to see if the unpaved road to Lockett Meadow is open (it can close). 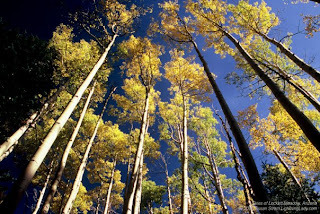 Lockett is a large aspen grove about 5 miles in, entered on the eastern side of the San Francisco Peaks. The road to Lockett is an unpaved mountain road, one lane in spots, but short. 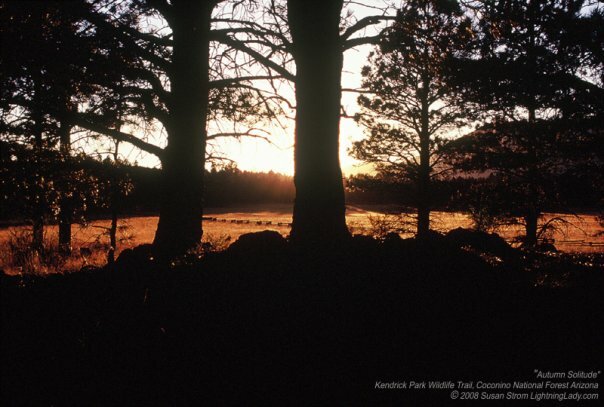 Ask a Flagstaff ranger station about Hart Prairie too, on the west side of San Francisco Peaks. 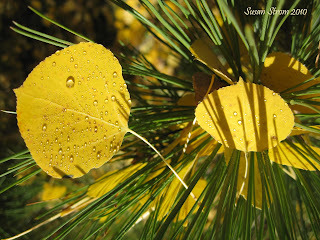 It can also offer fall aspen color. When hunting fall aspen color, I check first with rangers each year, to ask about road conditions & closures, recent burn areas, and any control burns in progress. Rangers are very informed about color status too. 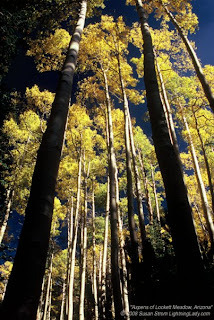 Remember, please don't carve the aspens! It sickens our beautiful trees. 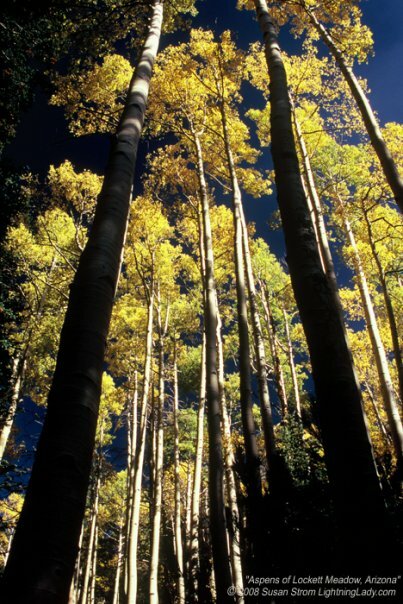 You're into Fall a little bit now and have seen some aspens. It's well into October. Maybe the high elevation roads, such as the access to Lockett Meadow, are starting to close for the snows. 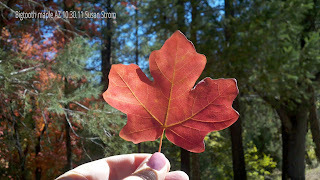 Now is time to seek the crimson leaves of Bigtooth Maple, golden poplars, and cognac-colored oak and sycamore. You're going to want a slightly lower, but still montane, elevation. A nice drive from the Phoenix valley is to take Highway 87 up to Payson, maybe grab breakfast at the Beeline Cafe (and a pumpkin spice latte' at the Starbucks inside Safeway), head out east on 260 to (paved) Tonto Creek Fish Hatchery Road. Drive-up creekside access is available at several spots. Patches of sycamore, oak, poplar, sumac, and canyon grape will be visible now. Then, head up the road to the Fish Hatchery, and you'll see Bigtooth Maple, just a few, one here, one there, along the road. 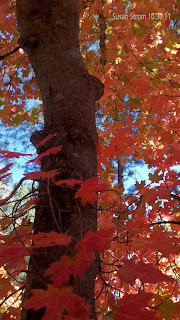 It won't be an entire hillside, but beautiful photos can be had near a maple tree at close range. Hopefully, they will be red and showy for you! 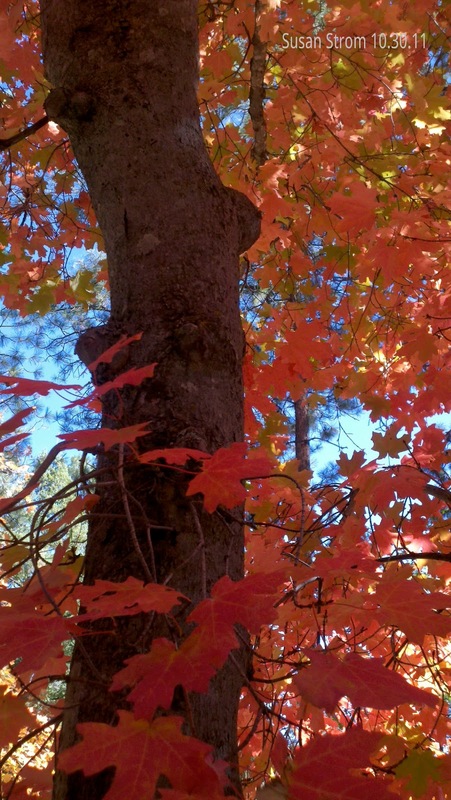 Maples grow in other places too, such as Sedona's beautiful Oak Creek Canyon, accessible via paved road, and are plentiful in the Pinal Mountains (unpaved access) above Globe, and can be found in mountain ranges in Southern Arizona. You have a Thermos full of hot cider, something Pendleton to keep you warm, car keys and map. It's late October and you seek meadows, vistas, oaks. Pumpkin pie wouldn't hurt either. You may wish to slip in one last trip to the Mogollon Rim before winter takes hold. 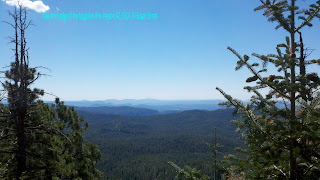 Highway 260, east out of Payson, up to the top of the Plateau (the Rim) is a beautiful ride. Several stunning cliff-edge vista points await on Forest Road 300 (look for the sign that says "Woods Canyon Lake" off 260). Military Sinkhole, Rim Lakes Vista Point, you'll see these incredible scenic overlooks from the paved road to Woods Canyon Lake. The autumn experience here will not be thick groves of eastern-style fall foliage, but rather the combination of stunning vistas, meadow and lakeside walks, with oak and aspen scattered about the woods. It is an opportunity to take in the chilly air and keep eyes & ears open for roving elk too. The road is paved to Woods Canyon Lake, but late in the season it will close for the snows. If afterward you need some warming up, there is a cabin-style restaurant in the woods, on the Christopher Creek loop road back down off 260 just under the Rim. If you have a good portion of the afternoon (I set out very early so I often do), a nice side trip might be to go back through Payson and head up to the small towns of Pine and Strawberry, on Highway 87 north of Payson. There you will find a quaint country town of Pine, with a few country stores & honey store, and in Strawberry, an original historic schoolhouse down a paved side road from the rustic Strawberry Lodge, known for pie. It's November now, leaves in the high country have fallen and you're wondering if there is anything left. Now is the time to check out beautiful Boyce Thompson Arboretum in Superior, Arizona for Fall Festival and the changing of the pistache trees. Be sure to check with the park to time it right so you can see the beautiful pistache trees at peak and for festival dates & events. Wear comfortable shoes in case you want to walk any hilly parts of the park, but you can access the fall color tree canopy via a completely flat and level trail (pictured below). You will love this park! It is about 60 miles east of downtown Phoenix along main Highway 60 three miles west of the town of Superior. Eat first, no cafe in the park, but you can bring a picnic. If you picnic, there is a lower lot nearer to the tables & trails. Before I get started for the day, I like to go up to the Buckboard Cafe in Superior for breakfast. 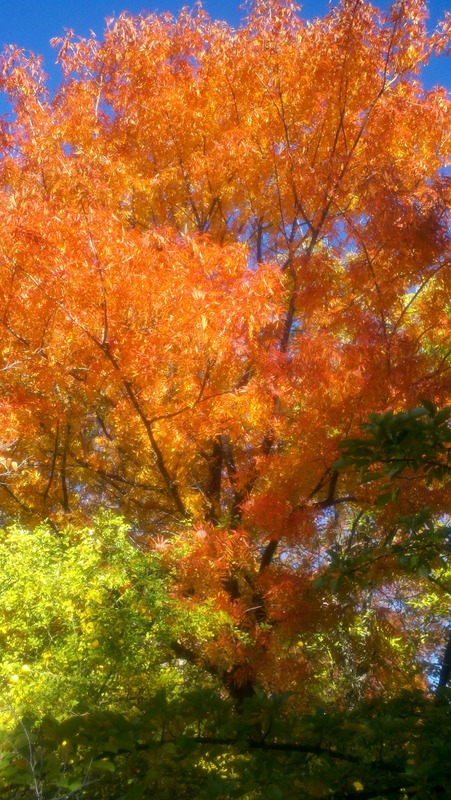 Be not denied your autumn fix, my fall-loving friend. 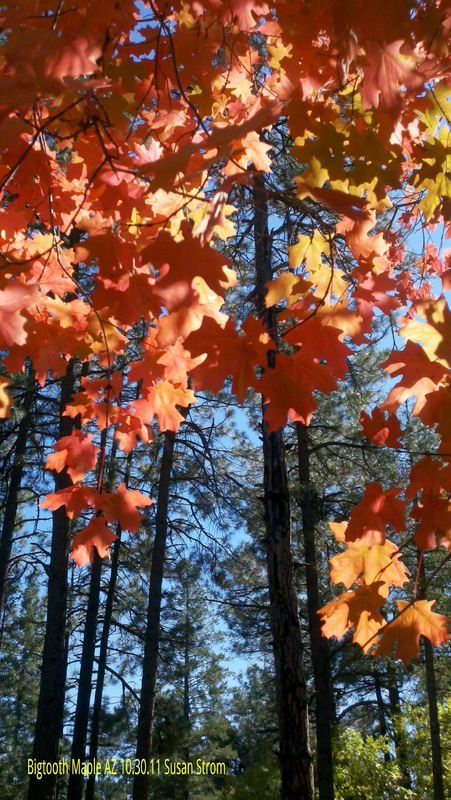 Arizona is full of secret wildernesses that will give you autumns to remember. There is nothing more precious than the wild lands, untouched and unspoiled by humans. 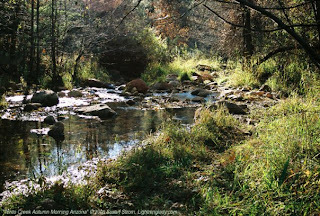 One would think that living in the American West would afford the adventurer miles upon miles of wilderness to explore. This is true, but even in my own lifetime I have seen mountains lost forever to development, grocery stores installed on scenic overlooks, and massive (to the tune of over half million acres) forest fires human-caused. I wrote a poem for those who might share the love of the remote places still untamed, and a passion for something larger than ourselves...the beautiful, inspiring, and fragile wild. 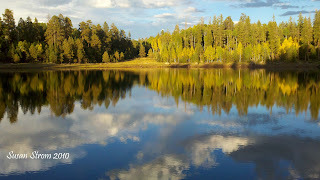 In particular, I was thinking about the The Mogollon Rim, the White Mountains, the San Francisco Peaks, Greer, the Escudilla and the eastern mountains, all in Arizona, when I wrote it. They are always on my mind. but will we hear their call?